Infections with Streptococcus pneumoniae are important causes of morbidity and mortality worldwide.S. pneumoniae, also known as the Pneumococcus, is a primary cause of community-acquired pneumonia, meningitis, and otitis media in infants and children. Globally, 4 million deaths occur in children under 5 years of age from pneumonia each year, and S. pneumoniae accounts for 20%–40%. In developing countries, approximately 2 million children under 5 years of age die yearly of acute respiratory infection, which is the main cause of death in this age group. The ten countries with the highest burden of pneumococcal infection are in Africa and Asia, together they account for two-thirds of the reported cases worldwide. Nigeria has the third highest disease burden after India and China and accounts for 5% of the global burden. Studies in Nigeria have shown that pneumoccocal infection accounts for 50%, 54%, and 60% of community-acquired pneumoniae cases in Zaria, Enugu, and Kano, respectively.,, Onyemelukwe and Greenwood reported an overall mortality of 39% in the 1980s in Zaria. The polysaccharide capsule on the outermost surface of most clinical strains of S. pneumoniae is the major virulence factor involved in evasion of the host immune system. Based on structural differences in capsular polysaccharides, 90 serotypes of S. pneumoniae have been identified, including serogroups 1, 4, 5, 6, 9, 14, 18, 19, and 23, which are the cause of approximately 80%–90% of invasive disease in the world., Globally, they account for 30%–70% of community-acquired pneumoniae cases requiring hospitalization. The World Health Organization estimates that 1.6 million people, including up to 1 million children <5 years of age, die of pneumococcal infection annually. Globally, out of the known 90 serotypes, about 20 serotypes account for >80% of invasive pneumococcal infection in all age groups. In addition, 13 serotypes have been implicated in >75% of invasive pneumococcal infection in children. The dominant serotypes associated with invasive pneumococcal infections worldwide include 14, 4, 1, 6A, 6B, 3, 8, 7F, 23F, 18C, 19F, and 9V.,, The existing serotypes in West Africa are types 1–10, 12, 14, 18, 19, 23, 25, 45, and 46. A study in Zaria, Nigeria, by Onyemelukwe and Greenwood in 1980, reported serotypes 1, 2, 3, 5, 18, 19, and 41 as the prevalent serotypes. Different serotypes exhibit differences in attack rates and colonization, case fatality rates, and clinical expression of disease. This study aimed to determine the prevalent serotypes of S. pneumoniae isolates in Ahmadu Bello University Teaching Hospital (ABUTH), Zaria. Determining prevailing serotypes in a locality is important to evaluate the efficacy of relevant vaccines in order to reduce morbidity and mortality caused by S.pneumoniae infections. This descriptive study was carried out at the Medical Microbiology Department, ABUTH, Zaria. The hospital is located in the northwestern part of Nigeria and serves as a major referral center for the north central part of the country. It offers specialist inpatient and outpatient care for all age groups, across various specialties. Clinical specimens were collected from a total of 420 patients over a period of 18 months. The sample size was determined using the Fisher's formula. Sputum, cerebrospinal fluid, blood cultures, throat swab, and ear swab specimens were collected from patients with pneumonia, meningitis, septicemia, and otitis media, respectively, from various wards in Paediatrics, Medicine, Ear, Nose, and Throat units of ABUTH, Zaria. Specimens collected were cultured on both 5% defibrinated sheep blood and chocolate agar at a temperature of 37°C for 18–24 h., The chocolate agar was incubated in a CO2-enriched atmosphere using a candle extinction jar. Isolates of S. pneumoniae were identified by standard microbiological techniques. Isolates were stored in skimmed milk and frozen at −80°C. Susceptibility to antimicrobials was determined by the modified Kirby–Bauer disc diffusion method using Mueller–Hinton agar supplemented with 5% sheep blood and antibiotic discs manufactured by Oxoid, UK. Erythromycin 15 μg, co-trimoxazole 25 μg, ciprofloxacin 5 μg, ceftriaxone 30 μg, cefuroxime 30 μg, chloramphenicol 30 μg, and oxacillin 1 μg were used. The results of the antimicrobial susceptibility testing were interpreted using the 2010 Clinical and Laboratory Standard Institute guidelines [Table 1]. Isolates were serotyped by the slide agglutination method using the Denka kit by Denka Seiken Co. Ltd., Japan, with batch number E2-E003/R01 10-10. These isolates were tested one at a time first with the polyvalent antisera and then with the respective monovalent antisera included for the polyvalent serotypes that showed agglutination. Visual agglutination that occurred within 1 min was interpreted as being a positive reaction; no agglutination was interpreted as a negative result. Positive and negative controls from the kit were processed alongside with the isolates according to the manufacturer's instruction. The serotype obtained was used for analysis and final results were recorded as matching, discordant, or nontypeable. Ethical clearance was obtained from the Health Research Ethical Committee of ABUTH, Zaria. A total of 420 patients participated in this study, of which, 227 (54%) were males and 193 (46%) were females. 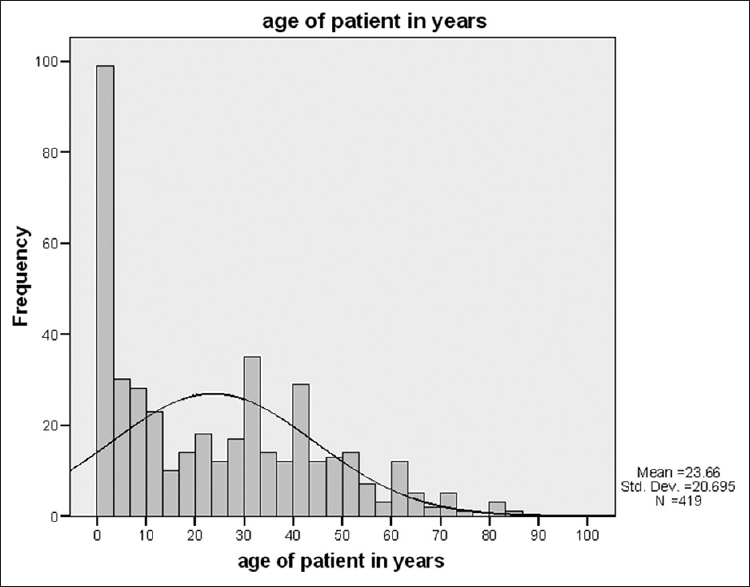 Their ages ranged from 2 days to 85 years and 23 (5.4%) were identified as S. pneumoniae [Figure 1]. Three different serotypes were identified in this study: 6, 19, and 20 belonging to polyvalent serotypes 2, 8, and 5, respectively. Serotype 6 was the most prevalent and was obtained from blood isolates. All the strains obtained from sputum were nontypeable [Table 2] and [Table 3]. Three different serotypes were found in this study and all were obtained from blood cultures. They were serotypes 6, 19, and 20. The most frequent was serotype 6. Studies on S. pneumonia serotypes have been carried out in Nigeria and different parts of the world.,, A study done in the 1980s in Zaria and Malumfashi found serotypes 1, 3, 5, 2, 18, 19, and 4. Serotypes 6 and 20 found in this study were not obtained then. This may be as a result of the emergence of resistant strains. A similar study done in Lagos in 2006 had 17 isolates with serotypes 23F, 19F, 6A, and 14 identified. This is similar to what was found in this study, although the Lagos study used only nasopharyngeal swab samples while sputum and blood were used in this study. Nasopharyngeal carriage of Pneumococcus is very frequent in small children, particularly those in day-care centers and other crowded settings because they are prone to colonization with a single or a few serotypes within a few weeks or months.,, Some of the serogroups prevalent in children are 6, 14, 19, and 23, which also show antimicrobial resistance, probably resulting from prior antimicrobial exposure. A study done in Ibadan, Nigeria, on invasive pneumococcal disease in children <5 years admitted in three urban hospitals found three major serotypes: 5, 19F, and 4. These serotypes however were different from that obtained from Lagos and Zaria studies. The distribution of pneumococcal capsular serotypes found in nasopharyngeal carriage and invasive pneumococcal disease was found to vary by age, geography, and socioeconomic status,,, which could explain these differences. In a study done in West Africa, which included Gambia, Nigeria, and Ghana, serotypes 5, 3, and 1 were found. Interestingly, in the USA and Europe, at the beginning of the 20th century, serotypes 1 and 2 accounted for up to 65% of lobar pneumonia cases and 75% of serotypes 1, 2, 3, and 5 of invasive serotypes.,,, Today, serotypes 2 and 5 are almost never isolated in Western countries and serotype 1 occurs below 10%.,,, In a study done in Turkey on healthy schoolchildren, the frequent serotypes were 1, 6, 19, 23, 20, and 17, similar to those found in this study. These serotypes are commonly involved in invasive pneumococcal diseases, highlighting the importance of nasopharyngeal colonization in the development of serious community infections. In Hungary, the dominant serotype strains was 19, which was also found in this study. While in France, serotypes 14 and 23 were the most common. These serotypes were different from those obtained from this study. The serotype distribution pattern seen in different countries today may indicate different susceptibilities to different capsular polysaccharides in hosts living under different socioeconomic conditions. In this study, S. pneumoniae isolates from sputum were nontypeable. Nontypeable Pneumococcus are often found in colonization and are due to absence of capsules. This is similar to findings in Lagos by Oduyebo et al. where some of the nasal swabs were nontypeable. This is also similar to a study done in China by Zhao, out of 112 S. pneumoniae isolates obtained from sputum cultures and serotyped using the Quellung test, 7% were also nontypeable. In a similar vein, a study carried out by Hanage et al. in Finland on nasopharyngeal swabs and middle-ear fluid of Finnish children among the nontypeable S. pneumoniae strains, 70% belonged to a pneumococcal lineage which had lost its capsular locus. Nontypeable S. pneumoniae isolates are frequently isolated from nonsterile sites, but are rarely isolated from sterile sites. Nontypeable S. pneumoniae isolates have been reported for many years. The major S. pneumoniae serotypes found in this study were 6, 19, and 20. The findings are important because vaccines exist against these serotypes, so including such vaccines in National Programme on Immunization will reduce morbidity and mortality. Surveillance for laboratory-confirmed pneumococcal disease should also be enhanced. Department of Health and Human Services (US). Centers for Disease Control and Prevention. Atlanta; CDC; Global Pneumococcal disease and vaccine; 2017. Available from: https://www.cdc.gov//pneumiococcal/global.html. [Last reviewed on 2017 Sep 06; Last assessed on 2018 Nov 06]. Hausdorff WP, Bryant J, Paradiso PR, Siber GR. Which pneumococcal serogroups cause the most invasive disease: Implications for conjugate vaccine formulation and use, part I. Clin Infect Dis 2000;30:100-21. Todar K. In: Online Textbook of Bacteriology; 2008. Available from: http://www.textbookofbacteriology.net/S.pneumoniae.html. [Last reviewed on 2012 Oct 05; Last assessed on 2018 Nov 06]. Scott JR, Hinds J, Gould KA, Millar EV, Reid R, Santosham M, et al. Nontypeable pneumococcal isolates among Navajo and white mountain apache communities: Are these really a cause of invasive disease? J Infect Dis 2012;206:73-80. Iliyasu G, Habib AG, Borodo MM, Babashani M, Ahmed M. Pneumococcal infection in Nigeria: Preparing for the vaccine. Sub Saharan Afr J Med 2014;1:15-9. The Global Burden of Disease; 2016;390:1083-1464-1970. The lancet. Available from: https://www.thelancet.com>lancet>issue. [Last reviewed on 2017 Sep 16; Last accessed on 2018 Nov 06]. Kalin M, Ortqvist A, Almela M, Aufwerber E, Dwyer R, Henriques B, et al. Prospective study of prognostic factors in community-acquired bacteremic pneumococcal disease in 5 countries. J Infect Dis 2000;182:840-7. Macfarlane JT, Adegboye DS, Warrell MJ. Mycoplasma pneumoniae and the aetiology of lobar pneumonia in Northern Nigeria. Thorax 1979;34:713-9. Nwosu CM, Anisiuba BC. A hospital study of adult community acquired pneumonia: Clinical and microbiological characteristics and response to penicillin. Orient J Med 1991;3:138-41. Onyemelukwe GC, Greenwood BM. Pneumococcal serotypes, epidemiological factors and vaccine strategy in Nigeria patients. J Infect 1982;5:157-63. Nurith P, David G, Noga GS, Ronit T, Orit S, William PH, et al. The important role of non typeable Streptococcus pneumoniae international clones in acute conjunctivitis. J Infect Dis 2006;194;689-96. O'Brien KL, Wolfson LJ, Watt JP, Henkle E, Deloria-Knoll M, McCall N, et al. Burden of disease caused by Streptococcus pneumoniae in children younger than 5 years: Global estimates. Lancet 2009;374:893-902. Pneumococcal conjugate vaccine for childhood immunization – WHO position paper. Wkly Epidemiol Rec 2007;82:93-104. Ortqvist A, Hedlund J, Kalin M. Streptococcus pneumoniae: Epidemiology, risk factors, and clinical features. Semin Respir Crit Care Med 2005;26:563-74. Henriques B, Kalin M, Ortqvist A, Olsson Liljequist B, Almela M, Marrie TJ, et al. Molecular epidemiology of Streptococcus pneumoniae causing invasive disease in 5 countries. J Infect Dis 2000;182:833-9. Sandgren A, Sjostrom K, Olsson-Liljequist B, Christensson B, Samuelsson A, Kronvall G, et al. Effect of clonal and serotype-specific properties on the invasive capacity of Streptococcus pneumoniae. J Infect Dis 2004;189:785-96. Greenwood BM, Hassan-King M, Onyemelukwe G, Macfarlane JT, Tubbs HR, Tugwell PJ, et al. Pneumococcal serotypes in West Africa. Lancet 1980;1:360. Alanee SR, McGee L, Jackson D, Chiou CC, Feldman C, Morris AJ, et al. Association of serotypes of Streptococcus pneumoniae with disease severity and outcome in adults: An international study. Clin Infect Dis 2007;45:46-51. Sleeman KL, Griffiths D, Shackley F, Diggle L, Gupta S, Maiden MC, et al. Capsular serotype-specific attack rates and duration of carriage of Streptococcus pneumoniae in a population of children. J Infect Dis 2006;194:682-8. Araoye M. In: Research Methodology with Statistics for Health and Social Sciences. 1st ed. Ilorin: Nathadexi; 2004. p. 115-7. Berman S. Epidemiology of acute respiratory infections in children of developing countries. Rev Infect Dis 1991;13 Suppl 6:S454-62. Brooks GT, Caroll KC, Butel JS, Morse SA and Mietzner TA. In: Jawetz, Melnick, Adelberg's Medical Microbiology. 24th ed. New York: McGraw-Hill Lange; 2007. p. 233-46. David G, Richard CB, John F. In: Medical Microbiology: A Guide to Microbial Infections: Pathogenesis, Immunity, Laboratory Diagnosis and Control. 16th ed. UK: Elsevier; 2008. p. 174-88. Clinical and Laboratory Standards Institute. Performance Standards for Antimicrobial Susceptibility Testing. Informational Supplement. 8th ed., Vol. 26. Wayne, PA: CLSI; 2010. p. M100-S22. Collignon PJ, Bell JM. Drug-resistant Streptococcus pneumoniae: The beginning of the end for many antibiotics? Australian group on antimicrobial resistance (AGAR) Med J Aust 1996;164:64-7. Antonio M, Dada-Adegbola H, Biney E, Awine T, O'Callaghan J, Pfluger V, et al. Molecular epidemiology of pneumococci obtained from Gambian children aged 2-29 months with invasive pneumococcal disease during a trial of a 9-valent pneumococcal conjugate vaccine. BMC Infect Dis 2008;8:81. Casal J. Antibiotic susceptibility of Streptococcus pneumonia; serotype distribution of penicillin-resistant strain in Spain. Antimicrob Agents Chemother 1982;22:222-5. Falade AG, Lagunju IA, Bakare RA, Odekanmi AA, Adegbola RA. Invasive pneumococcal disease in children aged less than 5 years admitted in 3 urban hospitals in Ibadan, Nigeria. Oxford J Clin Infect Dis 2009;48:5190-6. Oduyebo O, Nwaka DU, Nwaowolo C, Ogunsola FT. Resistance Patterns of Streptococcus pneumoniae Isolated from the Upper Respiratory Tract of Persons Attending Various Clinics of University Teaching hospital in Lagos. Nigeria; 2006. Available from: http://www. Unilag.edu.ng/index.php?page=publication-viewresearch&no=1&pub=14750. [Last reviewed on 2006 May 20; Last assessed on 2018 Nov 07]. Austrian R. Some aspects of the pneumococcal carrier state. J Antimicrob Chemother 1986;18 Suppl A: 35-45. Pons JL, Mandement MN, Martin E. Clonal and temporal patterns of nasopharyngeal penicillin-susceptible and penicillin-resistant Streptococcus pneumoniae strains in children attending a day care centre. J Clin Microbiol 1996;34:3218-22. Klugman KP, Friedland IR. Antibiotic-resistant pneumococci in pediatric disease. Microb Drug Resist 1995;1:5-8. Dagan R, Yagupsky P, Goldbart A, Wasas A, Klugman K. Increasing prevalence of penicillin-resistant pneumococcal infections in children in Southern Israel: Implications for future immunization policies. Pediatr Infect Dis J 1994;13:782-6. Whitney CG, Farley MM, Hadler J, Harrison LH, Bennett NM, Lynfield R, et al. Decline in invasive pneumococcal disease after the introduction of protein-polysaccharide conjugate vaccine. N Engl J Med 2003;348:1737-46. Skov Sørensen UB, Blom J, Birch-Andersen A, Henrichsen J. Ultrastructural localization of capsules, cell wall polysaccharide, cell wall proteins, and F antigen in pneumococci. Infect Immun 1988;56:1890-6. Tomasz A. Six newly recognized types of Streptococcus pneumoniae. J Clin Microbiol 1995;33:2759-62. Musher DM, Groover JE, Rowland JM, Watson DA, Struewing JB, Baughn RE, et al. Antibody to capsular polysaccharides of Streptococcus pneumoniae: Prevalence, persistence, and response to revaccination. Clin Infect Dis 1993;17:66-73. Donkor ES, Adegbola RA, Wren BW, Antonio M. Population biology of Streptococcus pneumoniae in West Africa: Multilocus sequence typing of serotypes that exhibit different predisposition to invasive disease and carriage. PLoS One 2013;8:e53925. Austrian R. Some observations on the pneumococcus and on the current status of pneumococcal disease and its prevention. Rev Infect Dis 1981;3 Suppl: S1-17. Bruyn GA, Zegers BJ, Von Furth R. Mechanism of host defense against infection with Streptococcus pneumoniae. Clin Infect Dis 1992;14:251-62. Finland M, Barnes MW. Changes in occurrence of capsular serotypes of Streptococcus pneumoniae at Boston city hospital during selected years between 1935 and 1974. J Clin Microbiol 1977;5:154-66. Loda FA, Collier AM, Glezen WP, Strangert K, Clyde WA Jr., Denny FW, et al. Occurrence of Diplococcus pneumoniae in the upper respiratory tract of children. J Pediatr 1975;87:1087-93. Robbins JB, Austrian R, Lee CJ, Rastogi SC, Schiffman G, Henrichsen J, et al. Considerations for formulating the second-generation pneumococcal capsular polysaccharide vaccine with emphasis on the cross-reactive types within groups. J Infect Dis 1983;148:1136-59. Nielsen SV, Henrichsen J. Incidence of invasive pneumococcal disease and distribution of capsular types of pneumococci in Denmark, 1989-94. Epidemiol Infect 1996;117:411-6. Butler JC, Breiman RF, Lipman HB, Hofmann J, Facklam RR. Serotype distribution of Streptococcus pneumoniae infections among preschool children in the United States, 1978-1994: Implications for development of a conjugate vaccine. J Infect Dis 1995;171:885-9. Verhaegen J, Glupczynski Y, Verbist L, Blogie M, Verbiest N, Vandeven J, et al. Capsular types and antibiotic susceptibility of pneumococci isolated from patients in Belgium with serious infections, 1980-1993. Clin Infect Dis 1995;20:1339-45. Dobay O, Rozgonyi F, Hajdú E, Nagy E, Knausz M, Amyes SG, et al. Antibiotic susceptibility and serotypes of Streptococcus pneumoniae isolates from Hungary. J Antimicrob Chemother 2003;51:887-93. Maugein J, Guillemot D, Dupont MJ. Clinical and microbiological epidemiology of Streptococcus pneumonia bacteremia in eight French countries. Clin Microbiol Infect 2003;9:280-8. Rolo D, S Simões A, Domenech A, Fenoll A, Liñares J, de Lencastre H, et al. Disease isolates of Streptococcus pseudopneumoniae and non-typeable S. pneumoniae presumptively identified as atypical S. pneumoniae in Spain. PLoS One 2013;8:e57047. Zhao GM, Black S, Shinefield H, Wang CQ, Zhang YH, Lin YZ, et al. Serotype distribution and antimicrobial resistance patterns in Streptococcus pneumoniae isolates from hospitalized pediatric patients with respiratory infections in Shanghai, China. Pediatr Infect Dis J 2003;22:739-42. Hanage WP, Kaijalainen T, Saukkoriipi A, Rickcord JL, Spratt BG. A successful, diverse disease-associated lineage of nontypeable pneumococci that has lost the capsular biosynthesis locus. J Clin Microbiol 2006;44:743-9. Facklam R, Pigott N. Description of phenotypic characteristics to aid in the identification of Streptococcus pneumoniae. In: Totollian A, editor. Pathogenic Streptococci Present and Future. St Petersburg, Russia: Lancer Publications; 1994. p. 415-7. Martin MJ, Turco ME, Zegans RR, Faddan S, Sodha JA, Elliot JH, et al. An outbreak of conjunctivitis due to a typical Streptococcus pneumoniae. N Engl J Med 2003;348:1112-21.